When your account has been created, you will have immediate access to cPanel. You can login using your cPanel name and password. Below is a list of all the options you have in cPanel, and a brief description as to what each option does. Displays any notices that IT has regarding the web environment. A search tool to help you quickly find what you are looking for in cPanel. Information regarding your domain name. Pay close attention to the "Disk Space Usage" row, as this shows how much of your web space has been used. Change the password for your web account, update your contact info/email preferences, and change the way cPanel appears. Backups and Backup Wizard are two ways you can backup your website online. Backups are done nightly by central IT, but if you need more frequently backups, or would like your own copy these are great tools. Disk space usage shows both how much disk you have used and where. View server logs for who has visited your site, raw logs and error logs which may assist with debugging your web applications. Please use Google Analytics for true web statistic tracking. From the security screen you can setup password protected directories. Note: if you would like to use shibboleth to protect a directory by KU online ID/password, please use the shibboleth documentation. You can also manage any SSH keys or use the Java SSH client here. Setup redirects from any url in your domain to a new url. 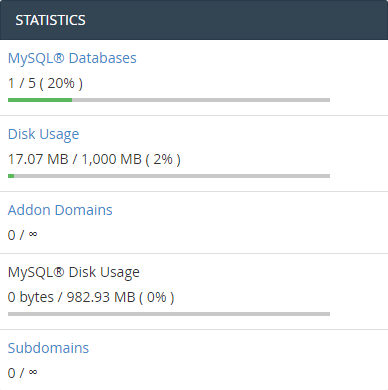 Use these tools to create new MySQL databases or manage them online. You are granted up to 5 MySQL databases for your account. If you need more than this, please contact webservices@ku.edu. Initialize PEAR for your PHP applications (done by clicking on "PHP PEAR Packages"). Once complete, you can install PEAR packages from either online or the command-line using SSH. Apache handlers can be used to change the way the webserver works with specific file types. Error pages can be used to customize how errors are display to your end-users. Cron jobs are used to specify regular-recurring application scripts. Network tools allows you to look up a domain name for its information, as well as trace the route you are using to get to cPanel. From the web applications screen you can easily install any version of wordpress or drupal for your site. In addition, this area can be used to perform patches and updates for your applications.